IRON X! 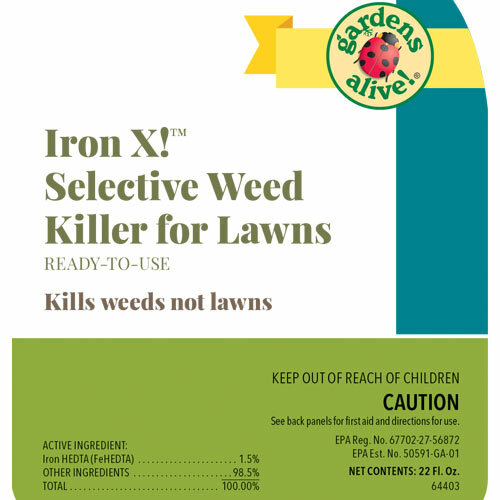 Selective Weed Killer | Gurney's Seed & Nursery Co. Effective yet gentle weed suppressor controls dandelions, white clover, chickweed, speedwell,algae, lichens and many more. Weeds begin to die within hours, but people and pets may enter the treated area as soon as the spray dries. Safe for new lawns. Effective even in cold weather.Lawns may be re-sown within one day of treatment.16 oz. concentrate makes 3.2 gallons. One gallon per 200 sq. ft. of lawn with hand sprayer.